People always seem surprised when I say that I cook a hot breakfast for my family most mornings each week. Honestly, it's not that much trouble. I'd choose eggs and toast (and sometimes bacon!) over cold cereal any day. And if I'm already cooking for myself, how hard is it to crack another egg or butter another piece of bread? Although we eat basically the same breakfast every morning, my hubby and I have vastly different approaches when it comes to presentation and eating technique. I prefer to appreciate the beauty and flavor of each food. 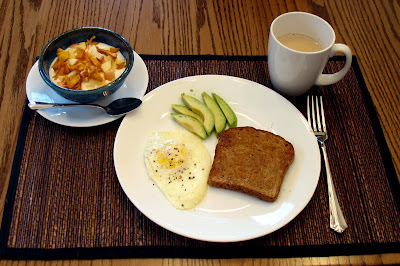 I might dip my toast into the runny yolk or mix some diced apple or dried fruit into my yogurt. But for the most part, I like to maintain a clear visual distinction between the various items on my placemat. He, on the other hand, prefers to smash all of his food into one messy pile. He then scoops globs of the yellowish-green concoction* onto slices of buttered toast. Oh, and in his view, a placemat is just another thing to clean up after a meal. Although we clearly enjoy our food in different ways, what we appreciate most about breakfast is the same: COFFEE! Just kidding! (Kind of.) The thing we appreciate most is the time we spend together, of course. Sharing a nice morning meal offers a chance to connect before we dash off in separate directions. In fact, provided that I don't look directly at the food spew sitting on the plate across from me, breakfast is my favorite meal of the day. What is in Kyle's egg!? It doesn't look normal at all! It's avocado! (Notice the nicely sliced wedges on my breakfast place.) But I agree. It doesn't look normal! Oh interesting! 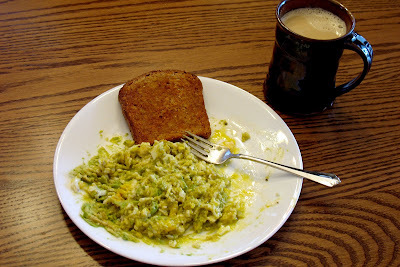 I have never thought of putting avocado's in my eggs...now I am going to have to try it!